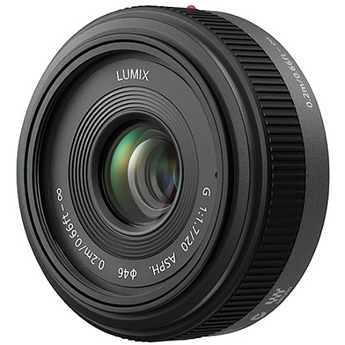 The Panasonic Lumix G 20mm f/1.7 Lens is a pancake-style lens that is very small and light and suitable for portrait and street subjects (it has a 40mm equivalent focal length in 35mm terms). This lens is compatible with Micro Four Thirds mount cameras only. It sports a very fast maximum aperture suitable for low-light shooting and naturally-lit portraits. • This lens is compatible with Micro Four Thirds mount cameras only.